Always up for exploring parts of Greater Vancouver that I’ve yet to visit, I never hesitate to say yes when J suggests a spontaneous adventure. No stranger to the North Shore, he took me to Lynn Canyon Park and Suspension Bridge. Instead of making our way to the interpretive centre, we rolled down the service road to the Lower Seymour Conservation Reserve [link]. I was surprised by the number of like-minded hikers and bikers that were also making use of the trails on a somewhat sunny Sunday evening. After a quick descent down narrow steps, we were greeted by Lynn Creek – water that’s run-off from melting snowcaps. The water was so cold that, within a few feet of the creek’s edge, the air temperature dropped noticeably by at least five degrees. A few steps later we found the Lynn Canyon Suspension Bridge, spanning the east and west sides of Lynn Creek. Heights don’t frighten me much and the view from the gently swaying bridge is breathtaking. Before making our way back to the truck, we wandered toward to Twin Falls Bridge and even spend a few moments perched on a boulder in the middle of the rushing creek before ascending the staircase. Anytime I’m surrounded by water I’m instantly in my “happy place” and Lynn Creek was no exception. A few years ago, Rebecca and John visited the park and took some great photos. 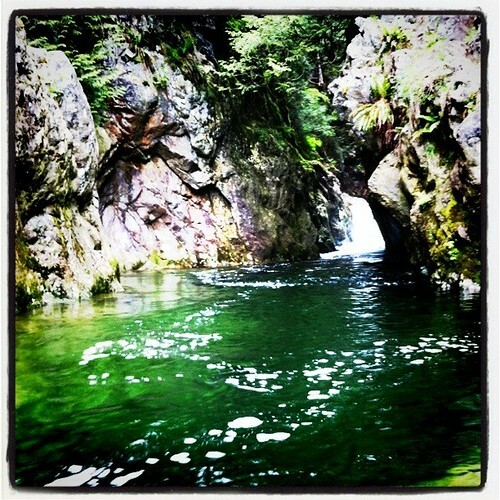 Rebecca posted some smart tips for those wishing to visit Lynn Canyon Park, so be sure to check out her post if a visit is in your summer plans. 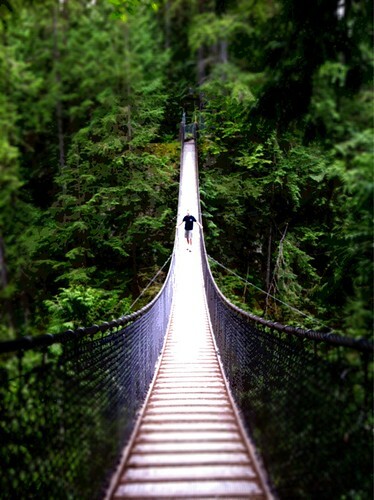 Find out more about Lynn Canyon Park and Suspension Bridge at the official website or follow them on Twitter. I like Lynn Suspension Bridge because it’s free. I also think it’s “scarier” than the Cap bridge because the rail is lower and the bridge is narrower. Whenever friends/family from out of town visit and want to neat place to check out, we always recommend the Lynn Valley area. Robyn used to hang out there a lot when she was in highschool and such. too. I know I need to check out more of the park as there are a few other trails I haven’t ventured down that Robyn says are pretty cool. There have been incidents of people loosing their life to the river though. If you’re not careful some spots can easily sweep you away down the treterous canyon. I love Lynn Canyon! We always bring out of town guests there, partially because its free! I too think it’s scarier, which is half the fun. We usually just cross the bridge, walk down to the water and then head back. I’d love to look into more of the trails and go on an adventure! @Danielle – Yes, Lynn Canyon is great! We’ll definitely take Jordy and a picnic lunch next time, but we plan on renting bikes this summer and making the 11km trek to the dam (or as close as we can get to it). 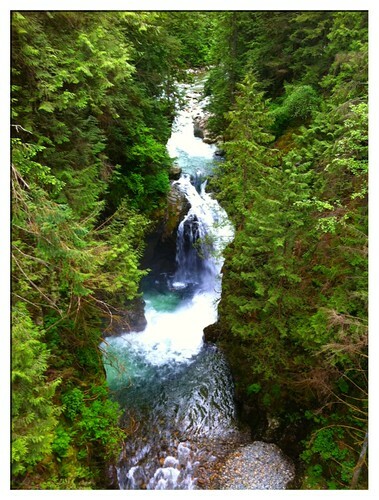 I *adore* Lynn Canyon. JT and I usually take a hike there at least twice a year. But with my stupidly crazy travel schedule this year we haven’t done it. We might sneak there tonight for a quick walk.